There are moments in everyone’s lives that are so strange, they might as well have been scripted. One of mine was a scant few years ago, during my second pregnancy. Well into my second trimester and approaching my third, I went to Macau with my husband, his family, and his family friends — getting one last plane trip in before airlines stopped letting me and my big belly on the plane. Macau is an interesting place, full of an interesting history that seems to get shoved to the wayside somewhere in favor of the new thing in town: casinos. Lots of them. Like Las Vegas, it’s now a place built on dreams, full of places built to look like other places, and other places meant to spend lots of money. It was also something that, aside from the food, we were singularly unable to share in: never gamblers, we awkwardly gawked our way through the lobby every day, watching the strange dances of the dealers and the hopeful, window-shopping our way through this and everything else. And it was definitely not a place for 6-month-pregnant me: just a few weeks before getting relegated to a wheelchair because of my enormous weight, I could only walk a few minutes at a time before having to sit down and rest. Not surprisingly, all that money changing hands tends to draw an interesting element, especially at night. There were an awful lot of beautiful girls milling around the shopping mall, looking like they were waiting for someone. Maybe they really were waiting, scanning the horizon for their friends, hatching plans to see a movie, getting ready to share some hot wings. I honestly don’t know. But when I sat down to rest my stretched pelvis for the umpteenth time on the long and arduous walk back to our hotel room, my husband sat next to me, and a girl sat next to him, and promptly laid her head on my husband’s shoulder. … (although not much of one, if your parents are just milling around, looking at bath salts close by. She eventually got up and walked away). The point of this long and tedious story is, strange combinations excite similarly strange feelings. It might not make sense, but it somehow works. This is something the Hokkien Chinese in Phuket — a community largely responsible for Phuket’s street food scene today — have taken to heart. Want oysters slathered atop a mix of egg, flour and cubed taro and dressed in lashings of minced garlic, soy sauce, bean sprouts and pork rinds? Sure, why not? 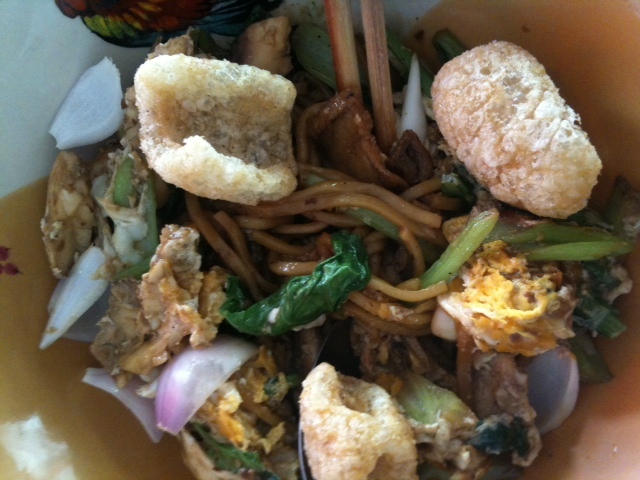 How about thick yellow noodles fried with pork, chicken, fish and crispy greens, topped with a raw egg yolk, raw slivered shallots and, again, pork rinds? Of course. 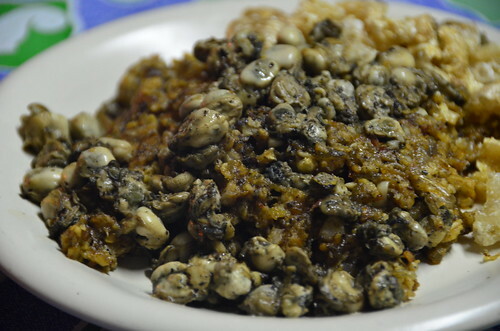 O-tao, the Hokkien-style oyster omelet dish, is best represented at Ji Pien, a stall that has been around for nearly 80 years in one location or another in downtown Phuket. 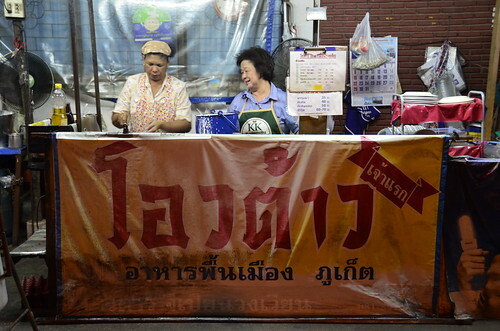 Its current incarnation, over 40 years old, is at a nondescript stall along Soi Phoonphol 7, where the hardworking chef churns out plate upon plate of o-tao topped with oysters, shrimp and/or squid (there is also a vegetarian version), as well as a small roster of curries atop kanom jeen (fermented rice noodles). For fried noodle lovers, there is also Mee Ton Poe, which enjoys two locations, but I always go to the one on Phuket Road. A vast range of fried noodle dishes awaits, many a variation of the mee pad Hokkien (Hokkien fried noodles) on nearly every menu in town, but the real treat here is, besides the amiable service, the curries the staff eat at lunch. I’m not kidding. They are homemade and delicious: fiery gaeng trai pla (Southern Thai fish entrail curry), or the milder and no-less-flavorful gaeng prik (chili curry). 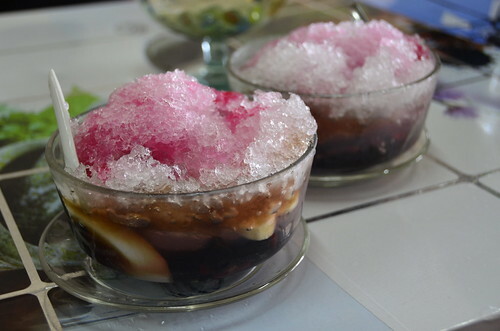 And if you still haven’t had enough of strange combinations, Phuket has you covered on the dessert side of things too: o-aew, a shaved ice dessert laden with bananas, colored syrup, and a jelly made from soaking o-aew seeds in water and said to protect diners from getting ulcers. Where to get it? At the moment, it’s available at a place called — where else? — O-Aew, across from the entrance to Soi Sun Uthit.